Besides coffee, I love to have fruit in the morning. In the morning, you wake up with a stomach empty and, based on my experience, I prefer to start the day with fruit or vegetables instead of processed food like bread, pancakes, eggs, etc. 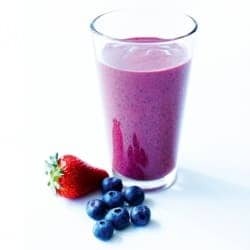 I’m a berry lover and love this morning shake! If you have the chance to buy fresh and local strawberries and blueberries then that’s perfect but, if not, you can use frozen too. Remember, fresh and locally produced ingredients are always a better option for a healthy meal, “Why you should buy seasonal locally produced food”. In the morning, I’m not a fan of cold drinks but add ice cubes if you prefer a really cold shake to start your day. Add all the ingredients and let it blend ! The blender I use and the models I recommend here.